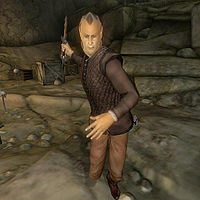 Enrion is an Altmer mage and a fugitive who is making his home in Bloodmayne Cave outside of Bravil. Enrion attacks anyone who trespasses on his hideout, in fear of being hauled back to prison. Enrion can be found in the second zone of Bloodmayne Cave with his fellow fugitive Dreet-Lai. Together they wander the cave aimlessly, presumably planning their next move. They seem secure in the fact that their fellows Hlofgar and Ashanta will guard the entrance of their hideout for them. He wears a quilted doublet, tan linens and a pair of doeskin shoes. He is equipped with an enchanted, leveled dagger. He knows the standard leveled Mage spells.